When I first found out that the ingredient for this season's collaboration was carrots, my heart sank. Because, you guys, I hate carrots. Always have, always will. I'll eat them if I have to, but I would never go out of my way to make a recipe spotlighting them. But the more I thought about it, the more I decided: challenge accepted! At first I thought about doing some sort of carrot cake, because that's the only way I like carrots--when I can't taste them. 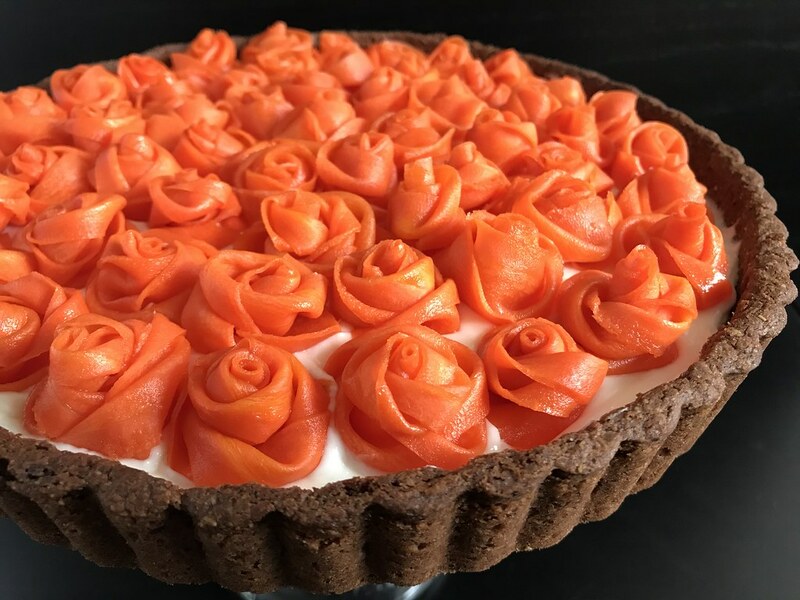 But then I decided I could push the envelope a little farther and came up with this tart, which is basically a deconstructed carrot cake, cream cheese frosting and all! I used Dorie Greenspan's spiced tart dough from her book Baking: From My Home to Yours, the cookbook the Food52 Baking Club is going through this month. It works well for this tart because it has the nuts, cinnamon, and cloves traditionally found in carrot cake. The filling is just a simple mix of cream cheese, sour cream, and sugar. 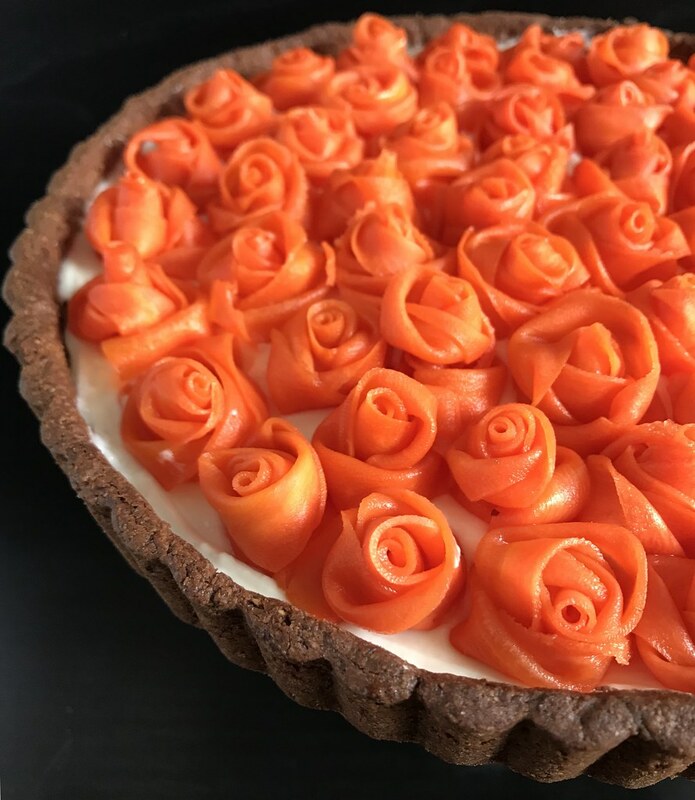 But the candied carrot roses is probably what you want to know about. I got that idea from Stella Park's Bravetart cookbook when the Food52 Baking Club went through that book a couple of months ago. She covers the technique on Serious Eats and her own blog, so I didn't bother taking pictures myself (plus, sticky hands + taking pictures = not good). 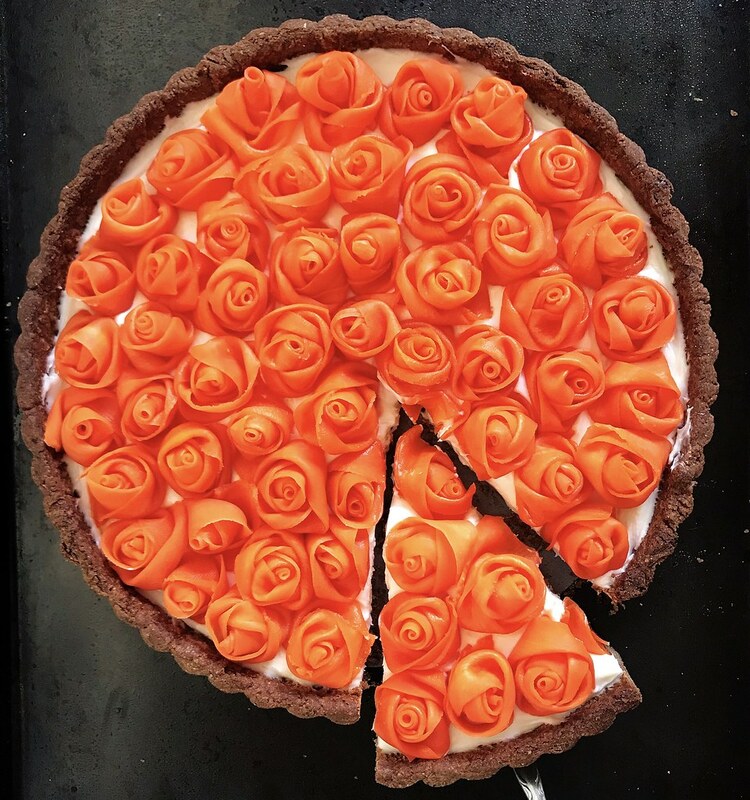 In order to make sure that I made enough roses to cover the top of the tart, I found a plate that was about the same size as the tart and kept making the roses until the plate was covered. It took me a little less than 6 large carrots to get there, including a bunch of ribbons that were too short. And I had to candy all the carrot strips in 3 batches since they wouldn't all fit into the syrup at once. 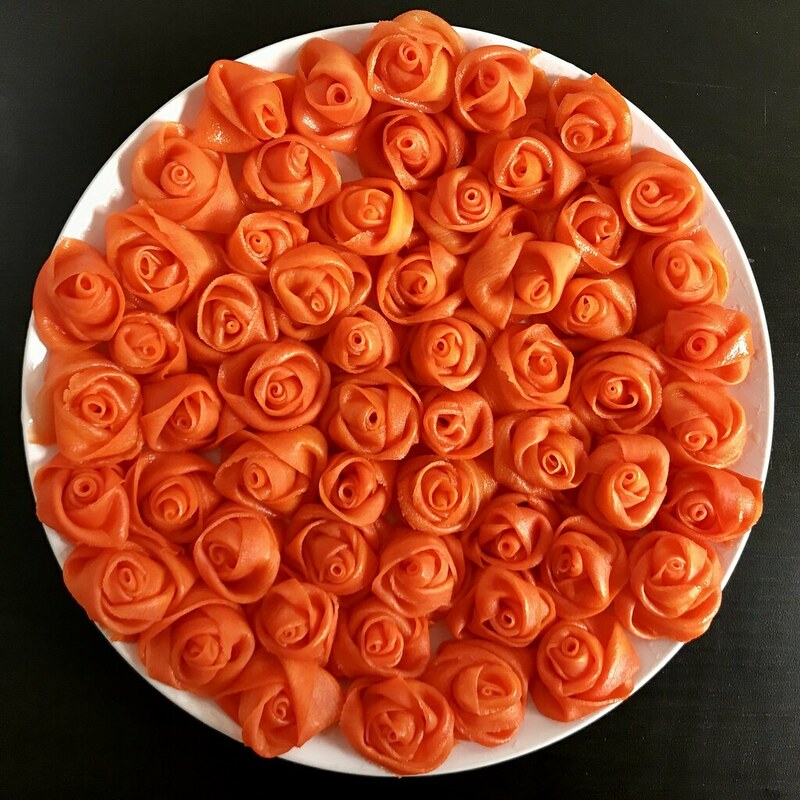 If you want some extra shine/sweetness, you could brush some of the leftover poaching syrup onto the roses just before serving. Use the paddle attachment in a stand up mixer or hand mixer to combine the cream cheese, sour cream, and 1/2 cup of sugar. 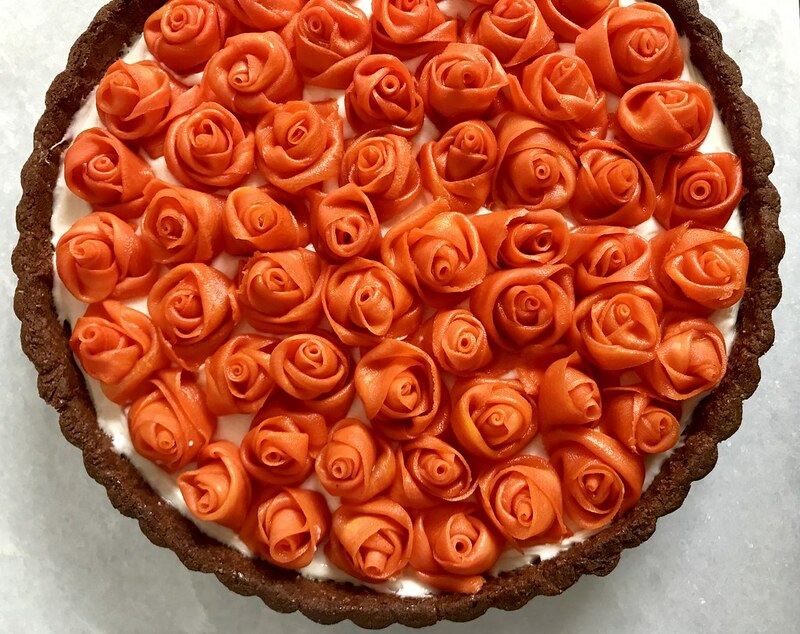 Spread into the tart shell and chill while you make the carrot roses. Combine the remaining 1 cup of sugar, lemon juice, cinnamon stick, and water in a medium saucepan. Bring to a boil and then lower the heat to a simmer. Cut off the carrot tops and peel. Then, using the vegetable peeler, peel the carrots into long, thick strips. Once all the sugar has dissolved in the syrup, add a third of the carrot strips. Cook for about a minute, then turn off the heat and allow the strips to cool in the syrup. Pick up one of the strips and squeegee the excess syrup off with your fingers. Hold the thinner end with one hand and start twirling the rest of the carrot strip around it to form a rose. Tuck the end underneath and set it down on a plate about the size of your tart pan. Repeat with remaining strips until you have enough to cover the plate, and thus, the top of your tart. 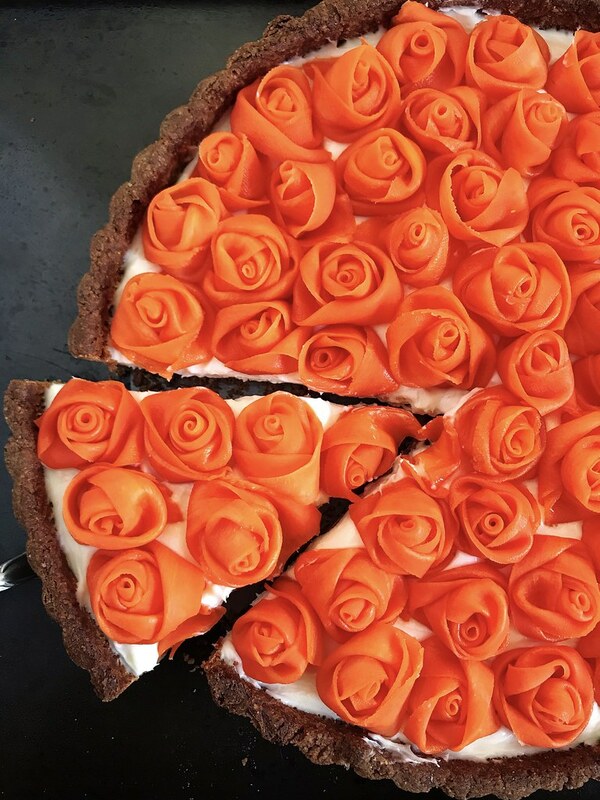 Carefully transfer the carrot roses to the tart and return to the fridge until ready to serve. This sounds delightful — I love the idea of combining the candied carrots with a spice-heavy crust (oh, Dorie! ), and cream cheese filling. Thanks! It's yummy even for a carrot hater!